The dress or outfit is made from Michael Miller's Raspberry Ta Dot fabric that has a dark red background and candy pink dots. The shoulder straps fasten with two hot pink buttons and you can either have hot pink piping trim the panel as shown OR small hot pink scalloped edge ribbon. 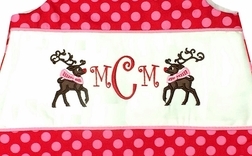 The panel is appliqued/embroidered with your little one's monogram in red, with two precious brown reindeer on either side. 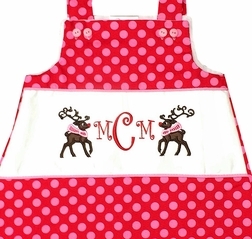 We fell in love with this reindeer design because of the fabulous big antler racks and the adorable striped scarves in the colors of the dress fabric.